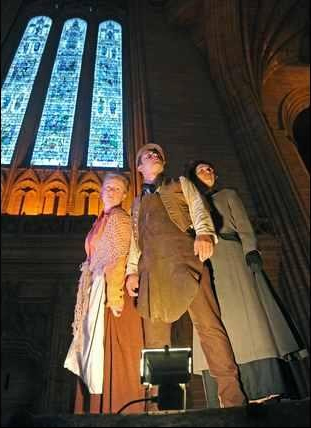 There is something fitting in setting a story about the Titanic in the Anglican Cathedral: both can be seen as monumental constructions dating from periods in which the human visionary was firmly in the ascendant. The Sea Odyssey was certainly one of the most spectacular events in Liverpool this year, but Treasured turned out to surpass even that. We entered the main entrance of the Cathedral, walking around piles of luggage, seeing people sitting around the luggage, reading or engaged in some other sedentary occupation. We were taken through semi-darkness, accompanied by a solo trumpet playing a tune that was neither mournful nor triumphant, into the main section of the cathedral, where we took our seats. As we sat waiting for the stalls to fill, ambient music played over a set of amplifiers. It allowed us to appreciate the acoustics of this incredible building, and I wondered how on earth the production would deal with the echoing. The stage was a skeleton of a ship that would serve throughout the play, suggesting the birth and the eventual death of the Titanic. Overhead the projection of a seagull flew: announcing the beginning of the drama. The Titanic is a story that has been told over and over. What more is there to say about it? A warning for man’s arrogance in thinking too big? This seems to be the only message that the story transmits. But Treasured was not about giving lectures on caution, and when the cast came on stage, against the backdrop of Belfast’s Harland and Wolff shipyard we were left in no doubt that although workers had been killed or injured working on the liner, the creation of this unique ship gave cause for celebration. The story unfolds through the telling of individual life stories, and the drama works as a ‘people’s history’, as we follow the story from the building and launch of the Titanic, to its disastrous maiden voyage. We begin with a Liverpudlian man telling the Belfast Docker that ‘we need the work’. 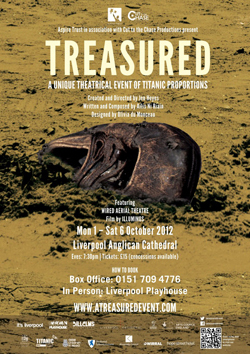 Treasured is a production that takes you out of the theatre and transports you not only back in time, but into one of Liverpool's most magnificent buildings. Christopher Hollinshead’s docker seems to speak for the whole city of Belfast when he announces how proud the dockers are to be working on this marvel. And there was something very inspiring about his talk of new technology and the opportunity that the Titanic offered for cheap travel. What we see of the passengers, such as the maid, Lucy (Nicola Bentley), is a yearning for a better life. And the story centres characters who embody that aspiration. The drama is intermingled with facts about the Titanic. The inventory is intoned, on stage, by the actors, while images of the logbook were projected around the walls of the cathedral. This particular moment is very poetical in the feel, and as such, borders on a choral work. Whether intentional or not, it was extremely moving. The music, that was integral to Treasured, incorporated beautifully a trumpet solo played by Brendan Ball; it was the same piece that we had heard as we entered the cathedral and moved around the tableaux. The piece, in the context of the drama, took on a sort of commentary, and was used for a beautiful and moving air sung from the choir stalls above the nave. Whilst aspects of Treasured were certainly spectacular (and much has been made of the projections), as a multimedia and site-specific work it was, in its entirety, incredible. The use of individual stories undercut the usual narrative of the Titanic, and its pessimism about humanity over-reaching itself. The section where we were shown the stock list for the ship could easily have pandered to banal anti-consumerist platitude; instead the combination of the projections and the chanting of the lists by the cast, only went to reinforce just what an enormous undertaking the maiden voyage of the Titanic was. Jen Heyes’ direction and Olivia du Monceau’s stage design certainly were impressive, but it is the vision of the composer and writer, Ailís Ní Ríain that really imposed itself on this work. That Treasured was a site-specific work was intelligently handled. The fact that much of the dialogue echoed throughout the cathedral was not a drawback but added poignancy to the story. The story of the Titanic bears relevance for us today when doom-mongers would caution against such human ambition. So the story of the Titanic ended in failure. Nick Birkinshaw’s character, at the end, seems to caution against such aspiration, yet the tragedy of the Titanic went on to inform the design of greater shipping that was both safer and cheaper. Those from outside of Liverpool may think that this is yet another excuse for the city to hijack one more historical tragedy to claim as its own (the dubious historical revision of the Slave Trade is one example of this city’s opportunism). After all, apart from Liverpool providing some of the crew and the fact that the White Star Line, the ship’s owner, was based in the city, the city played little part in the story. But I think that Treasured provided a universal story and it would be a great shame if it were not repeated in Belfast, Southampton or New York. In fact it would be a great tragedy if this work were merely left as another date in the calendar of Liverpool’s bicentenary. As a statement about humanity’s ability to overcome the restraints that nature imposes on it, Treasured comes across as a work that could stand the test of time. Whilst the tragedy ended in a huge toll of lives, how many did it go on to spare?